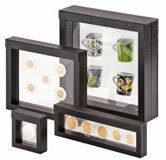 The frames of the NIMBUS Series offer a completely new way of setting the stage for your collectible items. The Special feature, of these frames, are two transparent, flexible silicone membranes which surround your exhibition items softly and which create the impression that they levitate inside the frame. The frame can be opened completely. the collectible is placed on one of the two silicone membranes and the frame can be closed. The object will be held in place by the surrounding silicone membranes, keeping it in its position. A magentic closure keeps the frame held together. On this page you'll find 13 Frames.